I fell for Elizabeth Holmes story, when it first appeared in Fortune magazine and then continued to Fast Company and Wired. The spinning of the vanity wheel most certainly impacted the inner workings of the company that raised over USD 900 million in capital and burned it with such zeal is if to change the laws of physics was possible by personal volition — or with the distortion field assumed by the leader of the company. 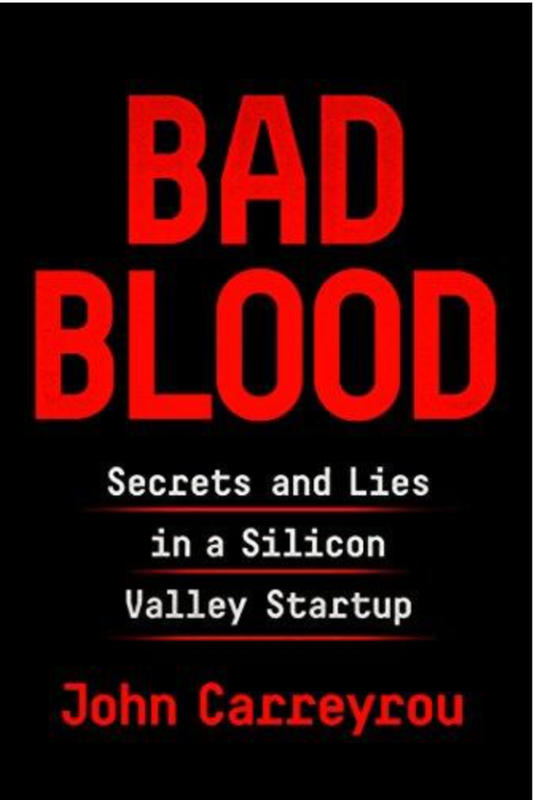 Not soon after the book was published, Elizabeth Holmes was indicted with criminal charges including wire fraud — yet this last chapter would only prolong the attention span, becoming a sideshow for a Hollywood movie being created and and HBO documentary being let by court to access company papers. A great story with Carreyrou interviewing most key members of labs that ran deceieving and borderline fraudulent tests (with variation coefficient for sodium and potassium going as high as low 40ies), that designed the machine that did assay analysis — crashing and freezing, unable to run the advertised dozens of tests at a time and so doing just one at a creaking speed. Healthy criticism and objective approach at dealing with problems was reprimanded and those responsible for them were let go with a paperwork of non-disclosure agreements. The company has basically eaten and collapsed on itself — pushed by the bloated ego of a prodigy, who did not deliver and chose to cajole, intimidate and deceive. Each cartridge cost upward of two hundred dollars to make and could only be used once. They were testing hundreds of them a week. Elizabeth had purchased a $2 million automated packaging line in anticipation of the day they could start shipping them, but that day seemed far off. Having already blown through its first $6 million, Theranos had raised another $9 million in a second funding round to replenish its coffers. The low interest rates and the depressed returns for traditional industries, both pharma, investment and banking contributed to the situation: easily believing into the promised new land of universal opportuity of needle-less tests done instantly and at home. Moreover, Theranos pitted them against Safeway, the latter committing a USD 350 million renovation budget for the promised riches of the retail footfall. Twelve months earlier, on June 5, 2012, Elizabeth signed a new contract with Walgreens that committed Theranos to launching its blood-testing services in some of the pharmacy chain’s stores by February 1, 2013, in exchange for a $100 million “innovation fee” and an additional $40 million loan. A spreadsheet with financial projections Sunny sent the hedge fund executives supported this notion. It forecast gross profits of $165 million on revenues of $261 million in 2014 and gross profits of $1.08 billion on revenues of $1.68 billion in 2015. Little did they know that Sunny had fabricated these numbers from whole cloth. Theranos hadn’t had a real chief financial officer since Elizabeth had fired Henry Mosley in 2006. The closest thing the company had to one was a corporate controller named Danise Yam. Six weeks after Sunny sent Partner Fund his projections, Yam sent very different ones to an advisory firm called Aranca for the purpose of pricing stock options for employees. Yam forecast a profit of $35 million in 2014 and of $100 million in 2015 ($130 million and $980 million less, respectively, than what Sunny projected to Partner Fund). The gap in revenues was even bigger: she predicted revenues of $50 million in 2014 and of $134 million in 2015 ($211 million and $1.55 billion less than the projections given to Partner Fund). As it would turn out, even Yam’s numbers were wildly optimistic. In the absence of real validation data, Holmes used these demos to convince board members, prospective investors, and journalists that the miniLab was a finished, working product. Michael Craig’s app wasn’t the only subterfuge used to maintain the illusion. During demos at headquarters, employees would make a show of placing the finger-stick sample of a visiting VIP in the miniLab, wait until the visitor had left the room, and then take the sample out and bring it to a lab associate, who would run it on one of the modified commercial analyzers. Reading through Walter Isaacson Steve Jobs biography, many elements from a visionary legend who did it were borrowed timeless times by aspiring entrepreneurs, who also far too often discarded the context of how negative traits were compensated by Jobs peers and people around him: his rambunctious temper was placated by the Pixar team, otherwise his genius storytelling traits would not have formed, allowing his return to Apple — and so was the story of Apple buying neXT — the realisation of how argument cannot survive just for the sake of it. There is also case of startups betting on the tech innovation curve, sitting out and patenting tooth and nail, waiting for the inflection curve to allow the economies of scale and scope to allow the idea to materialise in a stable product. In case of Theranos — it did not, but may it be a testament of how resolve should not be mistaken for hubris.